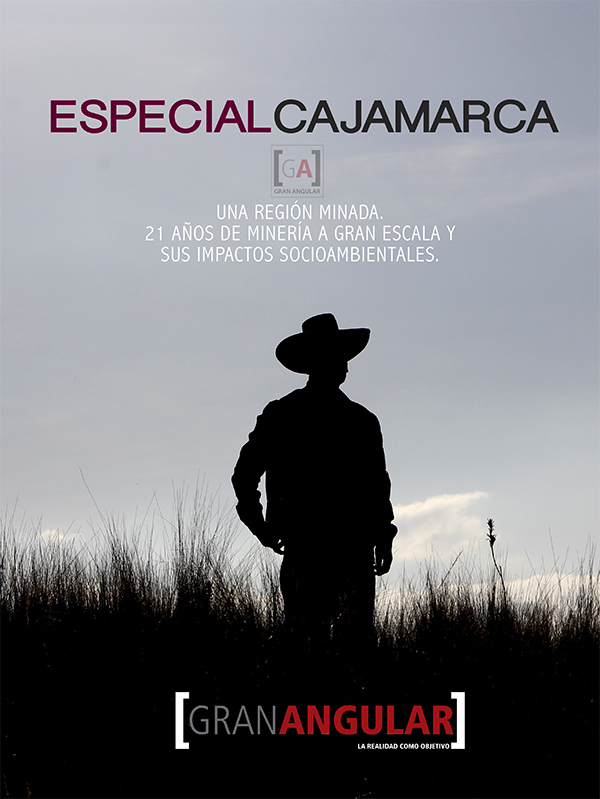 Since large-scale mining began in the area, Cajamarca has undergone a social transformation: the population has divided between the “pro-miners” and “anti-miners”. Between 2004 and 2013 11 deaths, 282 injured and more than 300 trials of environmental advocates have been reported around the mining conflicts. According to a study of the organization Global Witness, Peru is the fourth deadliest country in the world for environmental and land defense activists. At least 57 activists were killed between 2002 and today, and most of these deaths occurred in conflicts over mining projects. 56% of the alleged perpetrators of these deaths were police, and 17% were these security forces along with the armed forces and private security personnel. Around Cajamarca, there are stories of families separated by the “gifts” Yanacocha has given to silence accusative voices. There are stories of women who have been left alone and in poverty after the death of their husbands and children. This mining region contains stories of impunity, of weapons and bullets without owners. 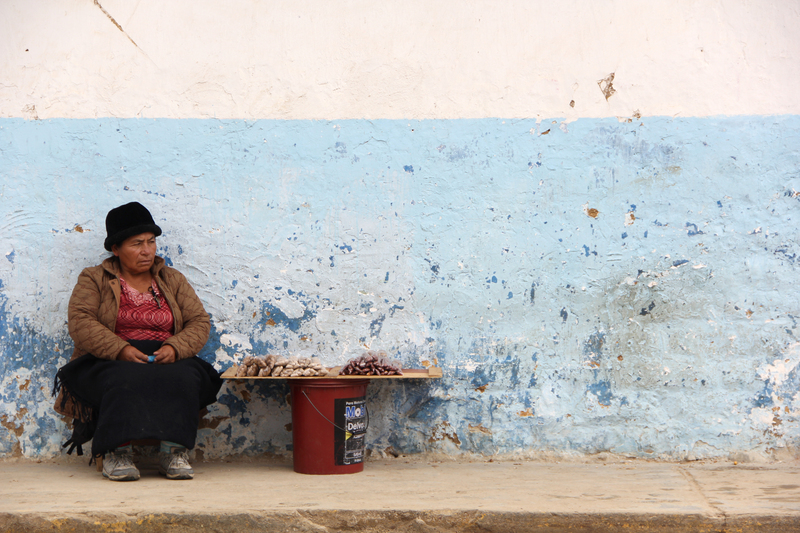 In the land of Yanacocha, protests are suppressed, and deaths are forgotten. Tears fall from her eyes and run down the wrinkles of her old face. Paula Llanos cannot hold back the tears as she starts talking about her brother, Isidro. Her hands, hardened by life-long work in the field and deformed by arthritis, try to dry her tears. “The mine, they killed my brother, my “papacito”. They killed him only for protecting the water. These criminals, these crooks, they killed him”, she cries. Isidro Llanos was a man from the countryside, who dedicated 58 years to cultivate land and raise livestock. On August 2, 2006 he was killed in Combayo. The river Azufre seemed to be doomed to a fate of contamination. The Yanacocha company settled in the Carachugo hill in the 1990s, and the first doré bar was melted. In 2006, the company’s intentions to expand the mining project (Carachugo II) mobilized the population. “We started organizing ourselves because we saw that the springs were drying – Yanacocha is destroying them. The people climbed the hill and found themselves surrounded by police, who blocked the entry. We wanted to see the water, but the police said it was a private property. That started the conflict, and that’s where they shot Isidro, a humble peasant”, says the local mayor, Carlos Alberto Huaripata. Members of the mining company’s former security firm, FORZA, and the police were involved in these conflicts. Who pulled the trigger of the gun that took the life of Isidro Llanos? Nine years later, nobody is guilty. “There is no justice. The mining company has money, and it doesn’t care about poor people like us”, says Isidro’s niece, María Benigna Tasilia. 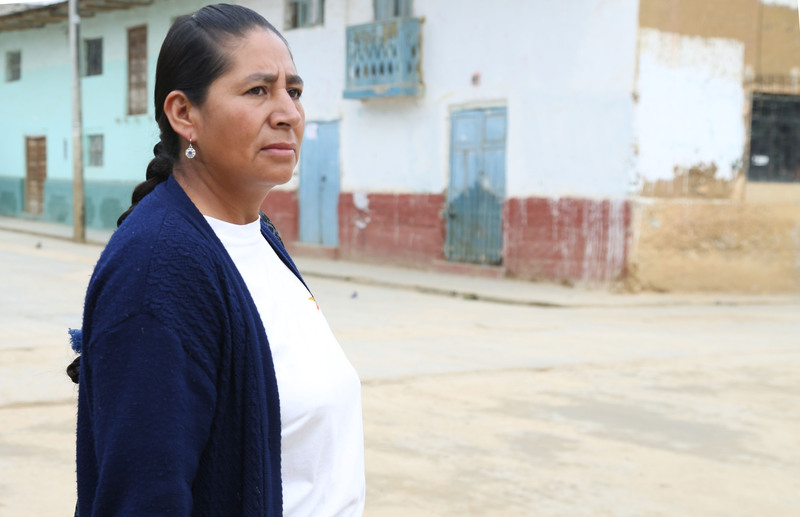 In December 2010, the Superior Court of Cajamarca decided to drop the charges against three policemen allegedly involved, claiming that there was not enough evidence to incriminate them. “I don’t have anyone to support me. My brother supported me, he bought me my food. Now nobody is giving me anything. I am old, I can’t do anything anymore. This how I live”, says Paula Llanos. She lives in a rusty adobe house with her family comprised of women. Cajamarca is the poorest region of the country: more than half of the population (53.7%) live in poverty and over 20% in extreme poverty, according to the National Statistics Institute (Instituto Nacional de Estadística, INEI), Enaho 2012. Two girls play lively with their sister, who is only two years old. For a moment, their laughter ignores the extreme poverty in which they live. Here, 36.1% of children under five suffer from chronic malnutrition. María Tasilia makes her way through the chicken to visit the grave of her uncle. She walks barefoot between rocks, dirt and grass. Her feet are thick and cracked. Paula kneels before the grave and starts to cry. When her tears begin to dry, and the emptiness slowly gnaws her stomach, she begins to sing a sad Andean song. It´s her comfort; like a lullaby, it calms her down. “My papacito, my brother…” Little by little she silences, letting her head, crowned with the traditional regional hat, fall down between her legs. The Conga project has been the catalyst for the campesino struggle against Yanacocha in Cajamarca. According to the records of the National Coordinator of Human Rights (Coordinadora Nacional de Derechos Humanos), 154 people were injured and five killed between 2011 and 2012, all allegedly by the police and the armed forces. The armed forces are not designed for the control of internal order: according to Article 166 of the Constitution, it is the police who fulfills this function. However, the Decree 1095, promulgated in 2010, expanded the conditions set out in the constitution, allowing the possibility of involving the armed forces without a State of Emergency. “This decree is considered the spearhead of the regulatory structure that has been drawn up, which tries to somehow criminalize protest and remove the responsibility of the armed and police forces,” said Juan Carlos Ruiz, a lawyer of the Legal Defense Institute (Instituto de Defensa Legal). This decree was faced by a claim of unconstitutionality, which was admitted by the Constitutional Court (Tribunal Constitucional), but has not yet been resolved. “According to Article 137 of the Constitution, the armed forces can enter when a State of Siege or a State of Emergency is declared. However, this decree allows them admission in situations where there is no declaration of such states for cases of drug trafficking, terrorism or protection of strategic bases, and, most dangerously, in situations where the capacity of the national police seems exceeded”, declares a report of the Institute of Democracy and Human Rights at the Catholic University (Instituto de Democracia y Derechos Humanos de la Universidad Católica, IDEHPUCP) on demand. A source close to the government, who prefers not to reveal his name, says that the decree was enabled because “declaring a state of emergency is politically costly, and governments do not have this provision of losing points”. “Those who take the political decision to involve the armed forces should know the consequences of that act, because they are not trained to perform police functions”, the source explains. “That’s the problem: when you decide to get the military out they come with rifles, and if you’re a boy of 18 years doing his military service, and a mob comes to you with sticks and stones… What are you going to do? React, and unfortunately that is what has caused several deaths”, the source explains. The decree states that, when the actions of the armed forces aim to conduct military operations to deal with a hostile group or element in a state of emergency, the rules of international humanitarian law apply. “The problem with this rule is that it confuses a state of emergency with an armed conflict”, says Renata Bregaglio, a human rights expert from the IDEHPUCP. “So the international humanitarian law applies to the situations of armed conflict, which lowers the level of legitimacy of the use of force. In the context of armed conflict, yes, the international law does authorize the use of major force in certain situations, or, in very particular contexts, accepts the death of a person. Cajamarca is clearly not an armed conflict”, says Bregaglio. Juan Carlos Eguren, president of the Justice Commission of the Congress (Comisión de Justicia del Congreso), appeals to the need for “order, authority and legality in order to have a democratic, stable and reliable system”, because otherwise, “we would live in anarchy”. He adds that “there is no particular concern about the regulatory issue in the congress, but on the contrary, there is a concern for social disorder”. Young César Medina devoted his time to defend something quite distant for those living in cities: water. “Water is life, mom. We have to keep fighting for it”, he told his mother with conviction. All the residents of Celendín and Bambamarca remember when the President Ollanta Humala visited them and asked: “Do you want to sell your water? Which one is more important, water or gold?”. The sense of betrayal among the population is highlighted in conversations. “The president sold his people to the mines, and sent us to be killed”, says Santos Huamán. On July 3, 2012, four civilians were killed in the main square of Celendín. In addition, 26 people were injured, seven of which belonged to the security forces (the national police and the army). A day later, Joselito Vásquez was killed in Bambamarca. More than three and a half years after these deaths, there is still no justice: nobody has been found guilty. In the case of Celendín, the Provincial Prosecutor of Chiclayo declared formalizing and continuing the preliminary investigation unjustified, according to the prosecutor’s resolution of January 7, 2014. The National Coordinator for Human Rights, as a defender of the case, filed a complaint and requested the case to be raised to the superior prosecutor, who upheld and determined that the investigation should be expanded. In the case of Bambamarca, the investigation has been in the stage of preliminary investigation since the incident. Despite the fact that these cases happened in Cajamarca, they need to be made known by the courts based in the region of Lambayeque, following the Administrative Resolution 096-2012-CE-PJ of the Judiciary (from May 31, 2012). More than three and a half years after these deaths, there is still no justice: nobody has been found guilty. On July 3, César Medina told his mother he would go to the church and then to an internet booth to finish some school work – even though his mother Maximila Aguilar had advised him not to go out into the street because there were protests. He was 17, he had three months left to complete the final year of high school, and he was the best of his class. The young man was to be part of the scarce 32% of the citizens who complete secondary education in the region. “I’ll finish my school and start working, mom, you won’t be suffering anymore”, he told her. “I worked hard to educate my four children”, says Aguilar. Celendín is the province with the largest percentage of poverty in the region, with a total poverty rate of 75.1% and 46.3% of extreme poverty. Maximila Aguilar returned home from the market around 2 pm, and seeing that her son wasn’t home yet, she went looking for him. The streets were full of police. She looked for him in the church and in the health center, where she found him lying on a stretcher. The wardens of the population against the Conga mining project gathered together voluntary contributions and other efforts, prompted debates and motivated strikes. They also turned on a political alarm that saw a threat in the way people were getting involved. Through the Supreme Resolution (Nº231-2012/DE) emitted on May 28, 2012 and the Supreme Resolution (No. 297-2012/DE) emitted on June 29, 2012, Humala’s government arranged an intervention of the armed forces in support of the national police in the provinces of Cajamarca, Celendin and Hualgayoc (Bambamarca). The objective was to “ensure the normal operation of essential public services”, based on the legitimacy granted by Decree 1095. This intervention was “to prevent the acts of violence that could occur as a result of actions to unfold because of the indefinite regional strike starting on May 31”. As a result, a military base was installed at the coliseum of the city. José Faustino Sánchez was a barber, but for some time he had worked in construction. According to his widow, Marisol Malqui, this was because stores could not be open due to the constant presence of the armed forces. José was the supporter of his family, because his wife has a heart condition. That day, July 3, 2012, he returned home to have lunch with her. “On the news, we heard there was a fire in the main square of Celendín, we didn’t know why”, Marisol says. According to police reports, at 11am a group 1500 protesters headed from the Casa del Maestro towards the main square. Around 12.40am the protesters supposedly started rioting by “violently throwing stones at police personnel and private property”, causing injuries to two members of the police. Shortly thereafter, according to these documents, the protesters set fire to the premises of the Municipality. At 1 pm, the police commander Juan Carlos Reátegui Izquierdo asked for military support in order to provide protection to the premises of the police, because, according to the prosecutor folder of the public ministry, a group of 800 people had the intention to set them on fire. The teams that were supporting the national police had 12mm shotguns, rubber bullets, riot helmets and shields. Some of them also had Galil rifles, which use the ammunition of 5.56 mm. Marle Livaque, the secretary of records of the Rondas Campesinas Unificadas in the province of Celendín, explains that around June 27th some workers of the Municipality had warned them that there would be an attack at the municipality, and that they were about to burn their facilities and cast the blame on the protesters. A complaint was filed upon this. Livaque states that there were information leakages that sparked the riots. Around 4 pm, José Faustino Sánchez left work to go home as told by his boss, who wanted to keep the workers out of the reach of stray bullets. On the way home, Sánchez was shot. Paulino Leonterio returned to Celendín on July 2nd. He came home for a few days to be with his wife Adelaida Amelia Tabaco and their two children, who were 15 and 14 years old at the time. Paulino, 43, had been working in Lima for a month because he couldn’t find work in his home town. This father also defended the water, because, as Adelaide repeats, “water is life”. On July 3, Paulino left his home at about 11.30am to visit his sister. All the streets of Celendín “were occupied by the military and the police”, says Adelaida. As he was returning home and passing through a street near the mainsquare, a bullet hit him in the lungs and the chest, causing his death. Joselito Sánchez was a 30-year-old bricklayer. That day he was installing majolica tiles in a house a few blocks from the main square. On the way from work he came across the protest. He decided to join it “to defend the water”, explains his mother Santos Huamán. “I was in the square but I didn’t know my son was as well. A policeman spoke to me ugly and threw me down”. Soon a helicopter flew over and that’s when the shooting started, Santos explains. She adds that, according to what people say, her son started filming with his cell phone, and at that moment he received the bullet. We pass through the central square of Celendín, where several posters are promoting for young people to apply for the police academy. Milton Sánchez, president of the Plataforma Interinstitucional de Celendín, believes that “it is not a coincidence. It is a strategy that they use to suppress their own people. The same goes with the proliferation of universities like Alas Peruanas, in San Pedro, which offers careers such as mining engineering. In this way, the young people are captured by the mines”. In the square, the past and present are confused as people tell what has happened. It seems as if one could still hear the echo of the dry, powerful and overwhelming sound of gunfire that claimed the lives of four neighbors. The autopsy reports found that in three of these cases, the death was due to “open head injury caused by a projectile fired from a firearm”. Marisol Malqui remembers it clearly. She will not forget it because she was present when the autopsy was done. “Without my presence, you’re not going to do it”, Marisol said, wanting to guard and protect her husband José Faustino. In the case of young César Medina, the autopsy records collected in the prosecution documents state that “it is possible to conclude that the projectile that hit the body of the victim had been shot by a member of the law enforcement that was in one of the helicopters that flew over the city of Celendín”. In the description of acts, it was stated that the forces of order performed dissuasive acts (not by lethal means). In the Nº156 report, published in March 2012, the Ombudsman stated that “the National Police of Peru does not have the adequate and sufficient logistics of non-lethal weapons to intervene in the situations of violence in social conflicts. As a consequence, sending police officers with deadly weaponry creates a risky scene, as they can consider themselves in the circumstances of making use of them”. He also warned of “the educational, logistical and regulatory problems of the national police regarding violence in social conflicts. The nature of this social fact was evident in the operation. If these problems are not addressed, police operations continue to occur in a scenario of high risk to the lives and safety of civilians and the police”. The Ombudsman, Rolando Luque, talks about the “lack of expertise of the national police in social conflicts in the country. Sometimes the lack of personnel leads to a division such as the DINOES, the special operations group that was created to make use of maximum force to confront terrorism and drug trafficking. Transferring the responsibility of social conflict scenarios to DINOES is a great risk”. “My blood, my life, all for the water, and my people, from the sky I will bless them to have victory”, reads the epitaph of Joselito Vásquez, who died on July 4 at the age of 28. His mother, María Alejandrina Jambo, took out a loan to pay for the funeral. Joselito died in the middle of a clash between the local inhabitants and security forces, during demonstrations against the Conga project that took place in the main square of Bambamarca. 8 civilians also got seriously injured. “Everything was full of police. They came straight to kill all the people. My son was working that day, he left the truck and they shot him. That day he was not participating in the protest”, his mother explains. Her son supported his family as a driver since he was 12 years old. “Who will provide for my little three-year-old grandson?” she asks. That day the government declared a state of emergency in Cajamarca through the Supreme Decree 070-2012-PCM. The Legal Defense Institute (Instituto de Defensa Legal, IDL) and Justicia Viva explain in their report that the government committed a “legal trick”, as this decree was officially dated one day before, July 3, 2012, so that it would be effective on the day of its publication, July 4. According to the Constitution, the decree is effective one day after its publication, which in this case should have been July 5th. Considering this change, the arrest of former priest and environmentalist leader Marco Arana on 4 July 2012 was illegal. According to the order of complaint by the National Human Rights Coordinator (Coordinadora Nacional de Derechos Humanos, CNDDHH), around 9.30 am on July 4 about 100 army troops turned up in Bambamarca to intervene in an operation against the demonstrators, eight of which were then severely injured. 42 non-commissioned officers from DITERPOL-Piura participated, and it is also emphasized that a police contingent traveled to Bambamarca in two vehicles of the mining company Yanacocha to support the commissar of the town. The case of Cajamarca, and specifically the protests against the Conga mining project raise the question: Which ones of the police officers also work for the safety of the Yanacocha company? There is an agreement of “lending special complementary services to police functions between Minera Yanacocha S.R.L. and the national police”. This agreement was signed on March 31, 2011 and it had a term of validity until December 31, 2012. However, it has been extended until July 31, 2014 and although it is unknown, this agreement still continues to be in force. In addition to the security forces, Yanacocha is using the services of the security company Securitas. The mining company and Securitas have been contacted, but they have refused to comment on the topic. These kinds of agreements are legal, they are regulated by Supreme Decree 004-2009-IN. According to the agreement, “the national police provides police security services in the areas owned by the mining company, in the areas of influence according to the risk situations that occur, and in any other place that requires them within the area of ​​operations”. “These agreements generate a vicious effect of privatization of internal order. The security forces are paid with the money of all Peruvians to fulfill its function. The concept of public order is lost. This is absolutely unconstitutional”, says lawyer Juan Carlos Ruíz. “This practice should be gradually eliminated. Besides, with this the police has two functions. In the end, we have exhausted police who have no period of rest, and for a responsibility as big as providing security, it will create a problem instead of solving it”, says Luque. “A little butterfly comes to see if we are doing well”, says Maximila Aguilar, who works as a cleaner at the school where his son César was studying. Now she must take care of her other three children alone: a 17-year-old living in Lima, another of 14 years and the youngest one of 8 years. Maximila speaks tiredly, she feels sick: “I don’t know what is happening to me, I get dizzy, my head whizzes. Sometimes everything seems unfamiliar, like I wasn’t me”. “My son helped me so much. He cared for me, he was everything to me, he was a father to his brothers. He told me he wouldn’t leave me”, she says. Marisol Malqui left Celendín behind. She now lives in Lima, in the district of Comas, in Collique. She lives in a small wooden house at the top of a hill, together with her sister, her brother-in-law and their children. “It is very sad. I came here, my family asked me what I was doing there alone.” Marisol doesn’t have a stable work. Occasionally, she cleans houses to provide for her little daughter of seven years. “How can it not be a crime to kill a person? Was he an animal?” she asks. The prosecution statement from January 7, 2014, by which the case was closed at first (the CNDDHH placed an order for complaint and requested the case to be raised to the Superior Prosecutor, who upheld and determined that the investigation be expanded), was striking in its conclusions: “There are signs of devious intentional homicide (…) as the victims have been hit by projectiles from firearms, possibly from the weapons carried by some members of the Peruvian Army”. “There are no indicators that would allow to determine that the victims have been in possession of firearms that they would have used to attack the police”, determines the prosecutor. The reason why the case was closed was lack of identification of the suspects, because, among other reasons, the Army has not provided the information required, such as the operational plan formulated to act that day, the ratio of staff patrols, or records of the delivery of arms and ammunition to the military. “Considering the expert statements and the autopsy reports, there is no doubt that the firing orders were not limited to deterrent shots, but that they were ordered to shoot directly to the body”, reads the complaint presented by the organization. “There are officers who gave orders, who designed an intervention plan. The soldiers and the police do not shoot if they have not been given a warrant. This has to be investigated, not only in terms of who were responsible for the shooting, but principally who were the ones to give the orders”, says Víctor Álvarez, a lawyer from the CNDDHH who works on these cases. “Since the Peruvian State was not able to create a dialogue to channel the demands of the people, and since it decided to respond to the conflicts with repression, which ended in deaths and injuries, the state should compensate these families. They should go beyond the determination of individual responsibilities by legal ways”, says Congresswoman Verónika Mendoza from Acción Popular-Frente Amplio. 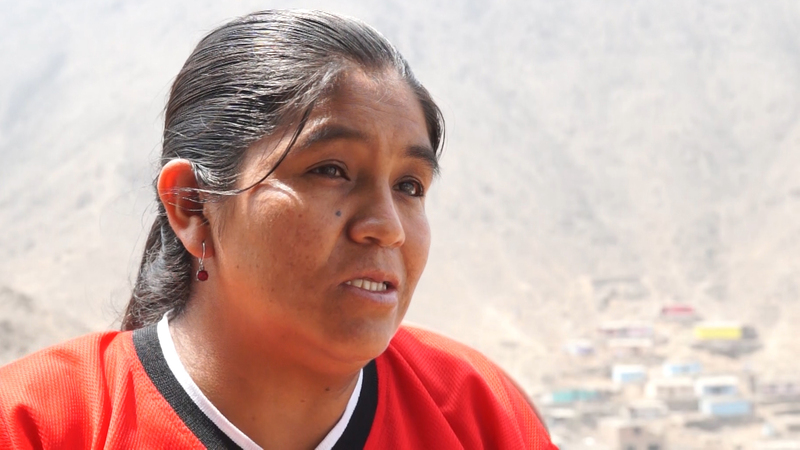 Mendoza adds: “There is no criminal or political responsibility, and that is the worst message the Peruvian state can give to a population that is only claiming for their rights to be respected”. To what extent can the decree 1095 prevent the proper investigation of these and other cases in ordinary criminal courts? Given that “the unlawful conducts attributable to military personnel during the actions taken, which were conducted as an application this Legislative Decree or in exercising their powers, are of jurisdiction and competence of the Military Police Court.” Víctor Álvarez states that “no impairment to the rights of people in this situation can be subject to military jurisdiction – so the Constitutional Court has stated”. The organization Human Rights Watch says that “international human rights bodies have consistently rejected the use of military prosecutors and courts in cases of human rights violations against civilians”. Mirtha Vásquez, the executive secretary of the organization Grufides, says that “these laws are useful for the business sectors, since it is against them that the right to protest has been mostly used because of the abuses and rights violations they are committing”. The lawyer highlights that in Cajamarca, more than 303 leaders are being prosecuted for issues of social protest, and “they are associated with the crimes of rioting, resistance against authorities and rebellion, and there are also prosecutions for terrorism. In addition, in many cases these norms are used to secure impunity for law enforcement in cases of violations of human rights”. Milton Sánchez carries 50 complaints, and receives threatening phone calls. The president of this organization further explains that two police centers have been opened in the areas of the lagoons, each with a capacity for 300 troops from the DINOES. “Social conflicts pose political problems. However, the answer being given, in many cases, is criminal-repressive. The criminal law is not made to face protests, but to pursue criminal offenses”, says a lawyer from the IDL. “There is a consolidation of the extractive neoliberal economic model started in 90 with Fujimori, and as this process extends and consolidates, it needs to enter new territories, requiring more energy, more water. This increases conflicts. What this model then needs is to limit the rights, and an increasingly authoritarian management”, explains Marco Arana, head of Tierra y Libertad. Yanacocha has marked a before and an after in Cajamarca. This company is not only Conga, nor is Cajamarca only Yanacocha. The demands and problems of the population are structural; if the state maintains this legislation and a pro-investment position without considering the populations, disagreement seems inevitable, and the consequences are predictable. The national police lends for security services only personnel that are on vacation, off, or have participated in meritorious deeds on duty… (4.1.3). Yanacocha is committed to cover the maintenance and repair of weapons, accessories and/or replacement of the police uniforms of state property, which as a result of the Police Security Service deteriorate… (4.2.11) The service at the mine amounts to 38 soles a day for each officer, and 18 soles a day for each non-commissioned officer… In special circumstances, with services in places without accommodation and food facilities, the service amounts to 78 soles a day. Furthermore, Yanacocha commits to an insurance policy for the police providing this service, which covers death (US $ 20,000), permanent disability (US $ 18,000), cures for serious injuries (up to US $ 10,000) and for minor injuries (up to US $ 3,500), burial (US $ 3,500) and 100% of transfer to medical care. In the tenth clause, the agreement states that when the “national police personnel perform an act of service in their police practice (and therefore are not being lent for the police security service), the obligations of Yanacocha, referred to in the fourth clause (in conditions in which the services are rendered), cannot be claimed, except for 4.2.2 and 4.2.4”, that is, the insurance and care in the medical centers of the mine. me regarding this website and at the moment this time I am browsing this site and reading very informative content at this time.